I got invited to a Laphroaig tasting at Lonesome Dove this evening, and since the weather had finally cooled off I decided to attend it kilted. I arrived a little late thanks to construction traffic on 121. When I got to the back of the restaurant I was greeted by some of the Beam Brands folks who were getting the tasting portion going. They were surprised that I wore my own kilt, and directed me towards where Simon, John, and the rest of the guests had gone. They were down at the Stockyards taking pictures and waiting for the cattle drive. I made my way over there and met up with the group. The Scots were pretty amused that I showed up wearing my own kilt and we had a pretty interesting discussion about state tartans. After taking some group photos and watching the longhorns get herded down the street we went back to Lonesome Dove and enjoyed a dram of the 10 year old. It’s the classic, still the best in my mind (though the cask strength does give it a run for its money). After that we had some line dancing lessons, which I attempted, but bailed after the first round. I have two left feet, and it was apparent that someone was going to get hurt if I stayed on the dance floor. The rest of the crew and guests had a good time though. We then got in line to get our food, which, in Lonesome Dove tradition was delicious. There was a black bean medley, some spicy potato salad, their signature cole slaw, wild boar ribs, pulled pork, and a berry cobbler. Paired with the meal were four different scotches; 10 year cask strength, triple wood, quarter cask, and the 18 year. Simon and John gave small talks about pairing each of them with parts of the meal (the triple wood went very well with the cobbler) and floated around the room talking and taking pictures. As things were winding down, I was talking to some of the Beam Brands folks who were in from Chicago and pointed a couple of them over to USA Kilts. As I was leaving they gave me one of the kilts they’d brought for the guests to wear. It turns out that they were supposed to be taken home by everyone in attendance, so now I’ve got a Sport Kilt Original in Gordon Modern added to the collection! 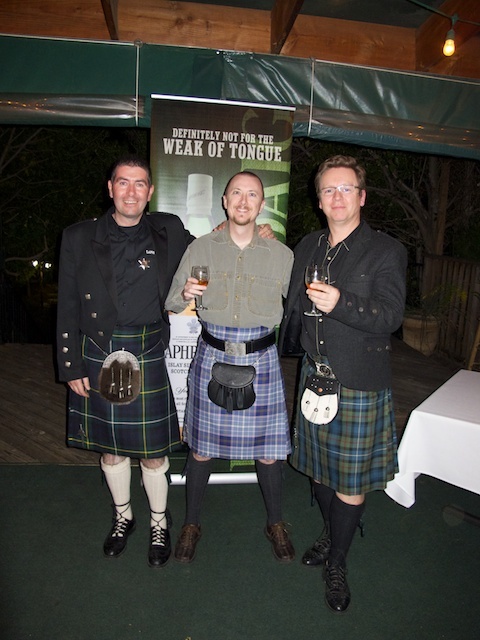 Here’s a picture of John Campbell, me, and Simon Brooking at the tasting. Do you like 1930s detective stories? Do you like the Dresden Files? What about a little action like Sky Captain or Kill Bill? Then get over to Amazon and pick up Hard Magic, the first book in the Grimnoir Chronicles series by Larry Correia. Have fun reading about magic using ninjas, gangsters, pirates, and soldiers. Blimps? Got ’em. John Moses Browning? Yep, he’s there too! This is a seriously fun book!